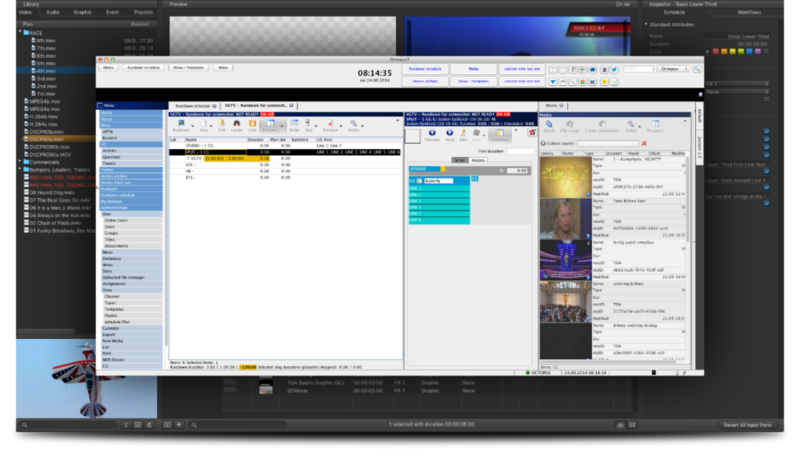 With its innovative user interface and powerful feature set, ToolsOnAir´s Broadcast Suite enables TV and News stations to easily integrate OCTOPUS newsroom systems and run stories with professional video and realtime graphic templates for news, weather, stock, sports, and other broadcast events. Final delivery is then achieved through just:live, the live based playout system built with the fast paced news workflows in mind. just:news provides thumbnail images and proxy video which are visible to the OCTOPUS users when creating and adding assets to their stories. Graphics can be easily added to a story through a set of user definable graphics templates. Values can be entered and changed within the interface of OCTOPUS and played out directly from just:live. Assets can be added to a story in OCTOPUS, edited within the NLE and attached to a placeholder via the OCTOPUS NLE Plugin available for Apple Final Cut Pro and Adobe® Premiere® Pro. just:news updates OCTOPUS with the duration and other relevant information. just:news supports standard MOS operations, like automatic updates of rundowns when making changes in OCTOPUS, plus clip status information (like PLAY and STOP) sent in realtime and reflected in the rundown window of OCTOPUS. just:news for OCTOPUS, is part of the ToolsOnAir Broadcast Suite, a complete set of powerful video production tools designed to create a professional TV broadcast facility on the reliable Apple Macintosh platform.